Nehal is mid way through his final exams and am looking at ways to please his growling tummy. He is ever hungry during exam time. Does it happen with your kids too? I had bookmarked a recipe for chicken stuffed buns quite some time ago but re-discovered it recently and got down to baking them over the weekend. 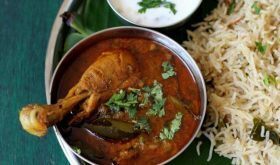 An absolute winner of a recipe from Ria’s mother, Mrs. Susy Mathew, who runs a food catering business. Thank you, Ria for sharing your mother’s stuffed buns recipe. These buns have become a hit not only with my family but friends and neighbors too. 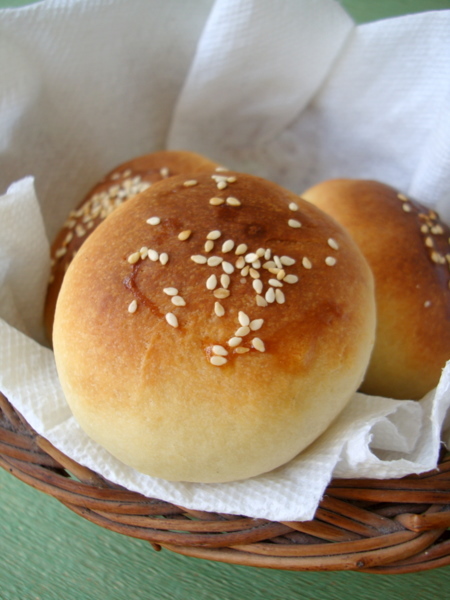 These stuffed buns have a light and airy texture and are perfect homemade snacks for kids. They work great for breakfast, as a lunch box snack or an after school snack. The filling is absolutely versatile. You can go the vegetarian way with the likes of paneer and mixed vegetables. Dissolve the yeast in warm water with 1/2 tbsp sugar and 1/2 tbsp flour. Leave aside for 10 mts. Boil the milk and cool till it is warm on touch. Add sugar, oil and salt. Mix well with a wooden spoon till the sugar dissolves. Add 1 cup flour and mix to a smooth paste. Add the beaten egg, yeast and mix. Add the remaining flour and mix well till it forms a smooth dough. Knead well for 10 mts. Let it rest till it doubles in volume (approx an hour or two). While its resting prepare the chicken filling. Punch down the dough lightly using your palm and divide the dough equally. Flatten each portion and fill with 1 tbsp of the chicken filling. Re-shape into a smooth ball. Sprinkle the top with sesame seeds. Let it sit/prove for another 20 mins. Bake them in a pre-heated oven at 200 degrees C for 10-12 mts. When it starts to brown, brush tops with egg white. Method for Chicken Filling - Heat oil in a heavy bottomed vessel, add the onions and saute for 4 mts. Add ginger garlic paste and saute for 4 mts..
Reduce the heat, add the red chili powder, coriander powder, cumin powder and garam masala powder and mix well. Add the shredded chicken and mix well. Add salt to taste. Cook for 3 mts. Turn off heat and cool. Add coriander leaves and mix. You can try different fillings of your choice. Grated paneer, mixed vegetables, green peas masala make for a good filling. White sesame seeds is optional. These buns taste good without the stuffing too. By Sailu Published: February 28, 2012 Nehal is mid way through his final exams and am looking at ways to please his growling tummy. He is ever hungry during exam time. Does it happen with your kids too? I had bookmarked a recipe for chicken stuffed buns quite some time ago but re-discovered it recently and got down to baking them over the weekend. These stuffed buns are perfect homemade snacks for kids. Do you think we can make the buns without egg? You can also make this eggless. Use 1 1/2 cups maida, 3 tbsp oil, 1/4 cup milk, 1/4 cup water, 3/4 th tablespoon active dry yeast, a tbsp of sugar and 1/2 tbsp salt. Add yeast to luke warm milk and sugar and keep aside till the sugar is dissolved. Add flour in a large bowl, add all the ingredients including yeast mixture and make a smooth dough. Allow to double in size, approx an hour. Follow rest of the recipe. Where can we get active dry yeast?and can this be replaced in this recipe? 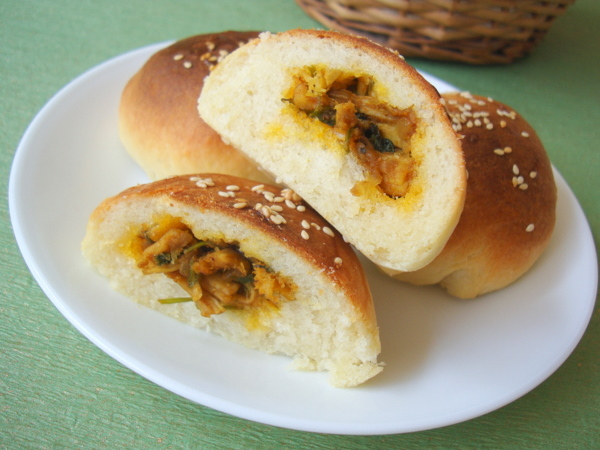 Hmm…looks very similar to Chinese stuffed buns. Same concept. 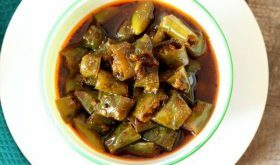 Hello Sailu, Thank you so much for trying this recipe…I have to tell Amma about this 🙂 She will be very happy! hi sailu it would also be a tempting snack for fussy kids.can we make it without adding egg? Yes, you can make these eggless. Use 1 1/2 cups maida, 3 tbsp oil, 1/4 cup milk, 1/4 cup water, 3/4 th tablespoon active dry yeast, a tbsp of sugar and 1/2 tbsp salt. Add yeast to luke warm milk and sugar and keep aside till the sugar is dissolved. Add flour in a large bowl, add all the ingredients including yeast mixture and make a smooth dough. Allow to double in size, approx an hour. Follow rest of the recipe. They look so mouth watering Sailaja! I use an OTG (Murphy Richards). Yes, am based in India. 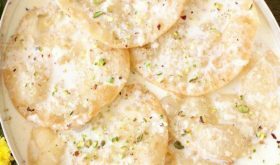 This is such a yum recipe Sailu! At your blog after a long time and love the cool neat layout. Hope you are doing great..
Why do we have to brush the buns after 10-12mnts with egg white ? any specific reason?? The egg wash is to give a glazed look (shiny) to the buns. Hi!Buns recipe seems to be yummy but my daughter is totally veg.so please tell if i don’t add eggs , ‘ll it come good.For filling i’ll replace chicken with other things. IN WHICH RACK BUNS TO BE BAKED?? MIDDLE? I too used to feel very hungry during my exams. These looks warm and delicious. I like the idea of the filling be made for vegetarians like myself. I’m just wondering though about egg replacement. 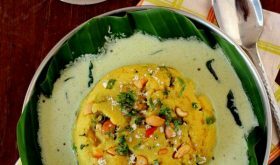 Was the egg in this recipe used to bind the ingredients or to make it soft and airy? I made these buns and they came out so well. Thank you Sailu.The dough seemed much too sticky at first but I stuck to the recipe and all was well. Try it out all of you!!! If I want to make these using wheat flour instead of all purpose, do any other proportions change? No, you can follow the recipe as it is. R U CERTIFYED CHEF ? I saw the recipe here and I had to try them. I want to tell you that they were incredible. My whole family was delighted. Thank you for the recipe. Best regards! using egg yolk for the wash brings out a nice golden colour on the buns. try it! 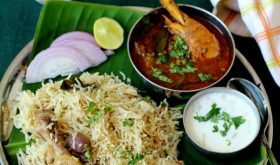 Hi Sailu, Is there any substitute for milk for this stuffed Bun recipe. My son is severely allergetic to milk. It would be helpful for the moms like me if you can mention alternative( like soy milk or some thing else that is non diary) for the diary products in your recipe whenever possible. I love your recipes. I try almost everything that is non diary. HI..what an amazing collection of recipes you have..have tried out some and it’s been perfect! Specially liked this chicken filled recipe. It came out so well and better than anything I have had in a shop. The only problem was that I had to use almost 4 cups of flour but it didn’t seem to matter as the buns were very soft. Thanks a ton for the recipe! Do you know if I can make the dough and save it for the next day for fresh buns everyday? Yes, refrigerate the dough after it rises. Use it next day. 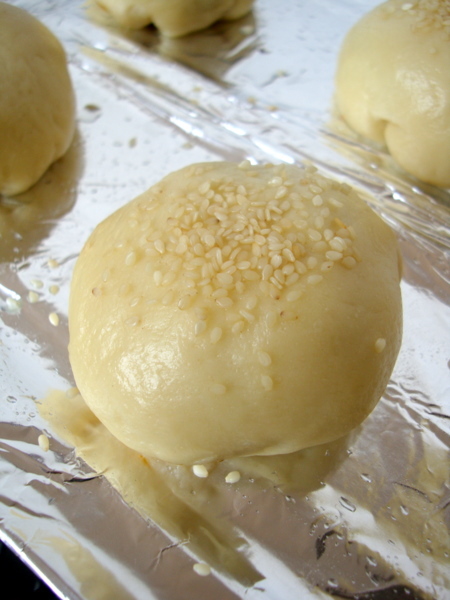 Once the dough has risen, stuff the filling and make balls and once they are risen, you can cling film them and freeze. When required, bring to room temperature and bake. I just tried it out today..both kids and adults loved it equally! Kudos for such great recipe. I have a combi oven (MW+convection+grill)…what mode should I be using to bake these and all things that need to be baked, like your pav buns etc. Some recipes to make us use these ovens rather than only heating purpose would be of great help, especially mentioning which mode to be used. Thanks. I m big fan of ur recipies. I tried this chicken bun recipe, but a small variation I made them with pizza dough, which I bought from a local bakery and made a vegi filling. I tastes awsome. Thanks for the recipe. Can u tell me what we can make with Ragi flour other than ragi malt and ragi mudda. Hello Sailu, thanks for a wonderful recipe. I tried it out today, the bun came out tasty, but mine did not brown on the top as yours… any suggestions ? is it the oven temperature or something else missing ? Sometimes if the top element of your oven does not work, browning does not happen. If your buns are cooked through but not browning, place it on the middle rack or top rack. Also pre heat oven for a good 15-20 mts or so. hi, i tried the buns, turned out great, just with baking time felt that, if baked(the top and bottom griller on @ 240 degrees C for 8 to 10 mins, they turned out better, but that worked well in my OTG, it may vary from oven to oven. just want to say lovely recipe, very simple and great to taste! thank you! Yes, you can make in advance. You can reheat at the time of serving. Dear sailu…I tried this recipe and it came wonderful..thanks a lot !! what if i want to make this same buns with 4 cups of maida, what abt the other ingredients quantity? can you please advise? Tried your recipe. It turned out to be very good. Can we also try this with fresh yeast ? A small request .. can you please post receipe for sweet buns also. Thanks. Yes, use fresh yeast. Use 1/2 tbsp. for shredded chicken, do we boil chicken and then grate it? if yes, do we need to add salt when boiling chicken? Also, i dont have an oven but i love the stuffing recipie. i plan to buy buns and fill in the chicken stuffing like a sandwich. does the chicken need any further cooking in this way because you are baking the buns along with the stuffing. No, it does not require further cooking. Yes, boil and shred and add salt at the time of boiling chicken. I LOVE CHICKEN BUNS. USED TO HAVE THEM ON STREETS. YUM! Hello, thanks for the recipe.. I tried it two times but unfortunately failed both times (my dough didnt rise both time). Once i followed exact recipe and kept dough for 3 hours still it didnt rise at all. Second time i used atta instead of maida and same result. do you have any inputs or suggestions? Also if i am using Microwave with convection and Grill which mode should i use, i believe convection. If the dough has not risen, the yeast you are using is not good. If the yeast is active, the mixture should foam. Is the cup meansure, the rice cup which is 160ml or the baking cup which is 235ml? I used the rice cup for consistency but felt the yeast at 1tbsp was more. Please let me know. I enjoyed making the buns! Thank you so much for the recipe. Wat is the temperature to be kept if we’re using a gas oven….I had kept it around 200’c….but my buns got brunt from d bottom n had not browned as well on d top…after completing it had become heavy n hard. wow, your bread is looking very delicious. in the evening I’ll take this. Superb recipe for kids and nutritious too. My suggestion however would be to make is with whole wheta flour so that it becomes all the more healthy. thanks. Buns Look perfect!! Going to try it soon. Made this today and they turned out fantastic. I did lessen the oil to 1/4 cup as the dough was already too wet. Maybe because my egg was large. I didn’t do an eggwash, because they were already brown, by the time, ten minutes were up. Pay close attention to the second proving time. Twenty minutes proving makes a difference.